This has been an extraordinary year for British poker - Toby Lewis, David Vamplew and Roberto Romanello have all taken their turn lifting the EPT hardware this season. This stop was won by another Brit last season, Team PokerStars Pro Liv Boeree, and the San Remo title will now remain in British hands for another year with the crowning of Rupert Elder as Season 7 champion. Elder came into the day as chip leader but it wasn't an easy ride to first place. He lost the chip lead to Xuan Liu at one point, and then again to Max Heinzelmann heads up. Just half an hour ago he was one card away from becoming the runner up when he got his whole stack in with a set against Heinzelmann's straight on the turn, before the board fatefully paired on the river to make Elder a full house and double him back up to the chip lead. 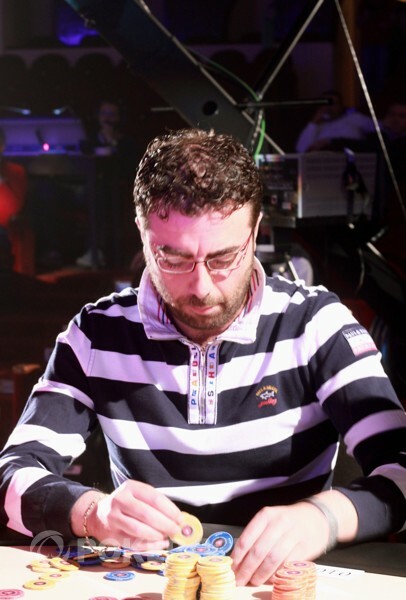 It was a high-class final all round, with Team PokerStars Pro and EPT Kyiv winner Max Lykov finishing in fourth place, a sterling effort made for Canada from third place finisher Xuan Liu and 2010 EPT Copenhagen runner up Francesco De Vivo picking up fifth place money. But the most notable achievement was that of runner up Max Heinzelmann - he's now finished twice in EPT finals, matching the achievement of Martin Jacobson and perhaps surpassing it owing to the huge fields in both of the tournaments in which he's now finished second. Still, the glory for now is with Elder. 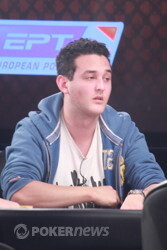 He, like Heinzelmann, cashed at EPT Berlin a few weeks ago, but only took 80th place there. Whichever spot he'd finished in, this final table appearance would have constituted his biggest ever live cash, but €930,000 and a ticket to the Grand Final must be very nice indeed. All of us at PokerNews and the EPT congratulate him, and we look forward to seeing him in just a few days' time in Madrid. Until then, it's over and out. Rupert Elder has just won EPT San Remo after admitting that his opponent actually played better than him during the heads up encounter. Spare a thought for poor Max Heinzelmann, he was one card away from being the new champion, but now has to settle for his second number two spot in a few short weeks. 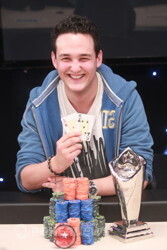 The trophy will stay on the British Isles after this final hand. Max Heinzelmann was first to act and he open shoved and Rupert Elder asked for a count before deciding it was his time to take his shot. Heinzelmann didn't even have two live cards and was going to need some serious help. The dream for Heinzelmann was over but he did have over €1 million in combined prize money as consolation (EPT Berlin and San Remo). Max Heinzelmann raised to 320,000 on the button and Rupert Elder defended in the big blind to see a flop of which both players checked. Elder led out for 400,000 on the turn and Heinzelmann flat-called to see the river. Elder now bet 900,000 only for Heinzelmann to raise to 2.7 million, Elder looked incredibly comfortable but made the call with - it was good as Heinzelmann could only turn over . Elder really in command now. Rupert Elder raised to 320,000 and Max Heinzelmann made the call. We saw a flop of and both players checked. The turn was the and the action went up a notch. Heinzelmann bet 175,000, Elder raised to 650,000, Heinzelmann pumped it up to 1,450,000 and Elder called. The pot was 3.5 million and Heinzelmann bet 3,075,000. Elder was riffling chips in his hand as his mind raced through all of the permutations. In the end he made the call and Heinzelmann mucked his cards unseen. The dealer shipped the massive pot over to Elder and he slid his cards unseen to the Dealer. You have to take your hat off to Max Heinzelmann. 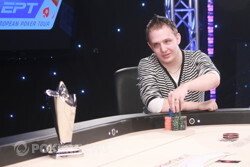 To make two back-to-back heads up encounters in EPT Main Event final tables in an amazing feat. Could he go one further? Well lets find out as we describe the most exciting hand of the heads up so far. Heinzelmann made the standard raise on the button and Elder called. Heinzelmann bet 300,000, Elder raised to 825,000, Heinzelmann raised to 1,700,000 and amazingly Elder called. This pot was huge! Elder checked very quickly and Heinzelmann asked Elder for a count before betting 2,410,000 and Elder moved all-in before the dealer had chance to calculate the German's betting amount. Heinzelmann called and and we had a tournament defining moment. Heinzelmann had flopped the nuts and Elder had flopped a set . Heinzelmann had the chip lead and was one card away from winning EPT San Remo and going one step further than at EPT Berlin a few weeks ago. All he needed to do was to avoid the board pairing or a fourth six from landing. That card was like a dagger through the heart of Heinzelmann. Elder had taken the chip lead one card away from being eliminated. Max Heinzelmann min-raised to 320,000 from the button and Rupert Elder called, meaning that they got to see a flop - . Elder check-called 275,000 from Heinzelmann, and then check-called again for 630,000 on the turn. Elder checked a third time and this time the bet from Heinzelmann was 1,675,000. Elder thought about it but never looked terribly happy; eventually he folded and the 4 million pot nudged Heinzelmann further in front. 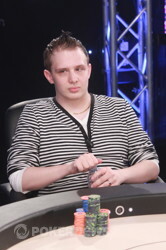 Max Heinzelmann raised to 320,000 from the small blind/button but Rupert Elder made it 825,000 in the big blind. Heinzelmann then replied with a raise to 1,785,000. Elder decided to call and the flop came , Elder checked and Heinzelmann fired out a cool 2 million in chips. Elder check-raised to 4 million but the German quickly moved all in and Elder folded with a hint of frustration. The chips are almost equal.